Google announced Brillo, a new operating system based on Android and targeting the Internet of things, at the end of October. The company also disclosed that ARM, MIPS and x86 architectures were supported via respectively TechNexion Pico-i.MX6UL system-on-module and PICO-DWARF baseboard, MIPS Creator CI-40 board, and Intel Edison development board. 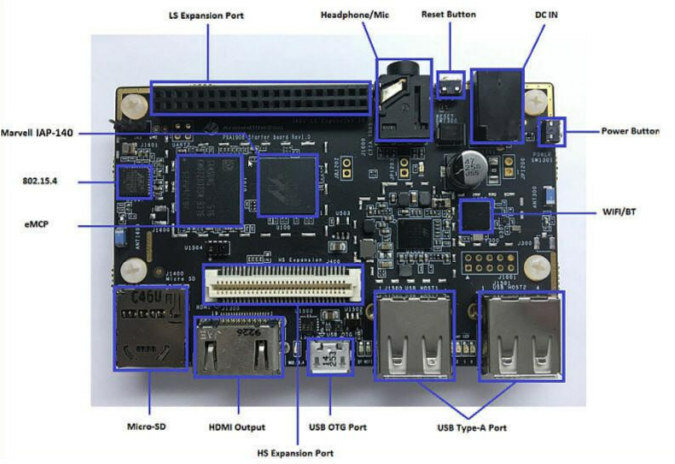 A few days later, Marvell announced Andromeda Box, an IoT platform supporting Brillo and Weave, based on IAP140, a quad-core ARM Cortex A53 application processor for the “Edge” version, and ARMADA 385 dual core Cortex A9 processor for the “Connect” version, but without the full details. SoC – Marvell IAP140 quad core Cortex A53 processor @ 1.2GHz with Vivante GC7000UL GPU supporting OpenGL ES 3.0, OpenCL and DirectX. 2.4 GHz WiFi 802.11n 1×1 / Bluetooth 4.0 combo radio (88W877) with on-board antenna. 802.15.4 microcontroller (88MZ100) with on-board antenna. There’s very little information about IAP140 processor on the net, but several pictures of the board show Marvell PXA1908 processor, so IAP140 could be a cost-down version without LTE support. You can find more information about the board by reading the Quick Start Guide or Hardware Manual, and access Brillo BSP on github. 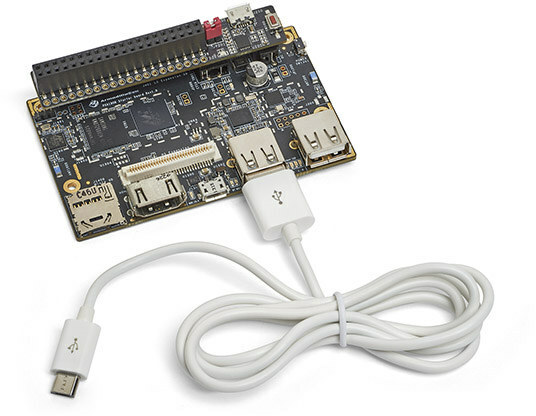 I could not find any details about AndroMeda Box Connect, but I would not be surprised if it included Solid-Run ARMADA 385 microSOM used in the company’s ClearFog router boards. More details about AndroMeda Box initiative should soon surface on the official website, now just a placeholder.